If classical music wants new audiences it should feast its eyes on the photo above. You may not be able to hear the blazing music of Scriabin's Poem of Ecstasy played by the Concertgebouw Orchestra under George Benjamin in that 2010 concert. But you can certainly see the blazing visual music created by kinetic artist and portrait painter extraordinaire Norman Perryman. Today Norman is celebrating his 80th birthday. Not only does he have more energy than people a quarter of his age, he also has more creativity than them. If there were more Norman Perrymans in classical music it would be a better place and audiences would be younger and bigger. Happy birthday Norman! Also on Facebook and Twitter. Photo credit Ronald Knapp. Any copyrighted material on these pages is included as "fair use", for the purpose of study, review or critical analysis only, and will be removed at the request of copyright owner(s). The Australian Chamber, led by Richard Tognetti have been staging similar art-augmented concerts for a few years now. It has the useful side effect of keeping the very oldest and very youngest members of the audience awake. This concert was part of a series: Sound & Colour. Composer Scriabin is the classic example of one who was obsessed with the interrelationship and in at least one work demanded colour projections. My visuals are firmly rooted in the score and elucidate it, according to people who've been there, including other musicians and composers. 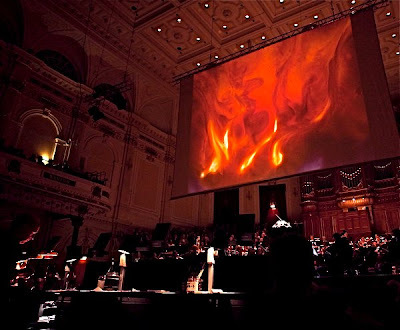 The visuals are not a plaster, but an integral part of a total work of art (as in opera). Yet the addition of any visual element to an abstract musical presentation is troubling. Does it not increase expectation among audiences for visual display during every composition, be it Missa Papae Marcelli or Timbres, espace, mouvement ou la nuit etoilée. Isn't the point to train and develop that inner eye (and ear) that allows for deep appreciation of that does not reveal itself as readily as an image? It seems to me the crux of the issue is a cultural assumption that if it cannot be seen it is not worth one's time.